The sub-title of this book is “A Modern Path of Initiation”. 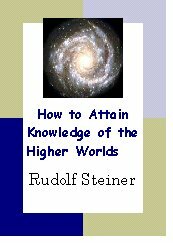 It is Rudolf Steiner’s original manual describing the steps one must take on the path of initiation if it is to be followed methodically and safely. Concentration and meditation exercises are described and, in addition, the result that can be expected: knowledge of the higher worlds. Translation: George Metaxa (slightly modified). Remember, you must have Adobe Acrobat Reader. (Click for free download).